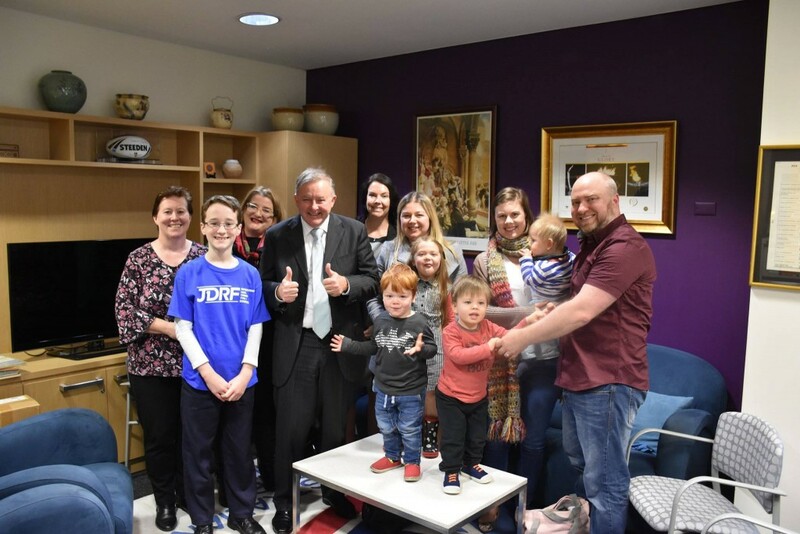 Anthony Albanese, Labor MP, met with two ENDIA families (the Jeffresons and the Russells, pictured on the right) and JDRF advocate, Ben, and his mum in Sydney recently. They discussed type 1 diabetes care and the importance of research into the condition including The ENDIA Study. Mr Albanese was really engaged and particularly interested with the device that Ben (in the blue JDRF t-shirt) was wearing. The pump takes some of the worry from his Mum (e.g. not having to wake in the middle of the night to check his blood sugars). The ENDIA families with younger children shared their stories with him. Mr Albanese was very attentive and also sensitive around the topic. As the current Shadow Minister for Infrastructure, Transport, Cities and Regional Development and the Shadow Minister for Tourism, he’s a busy man! So the families were very appreciative of him giving half an hour of his day and his undivided attention. Swiftly after the meeting, Mr Albanese leapt onto social media and urged eligible families living with type 1 diabetes to consider joining ENDIA. Thumbs up to you, Albo! Alex (one of ENDIA’s dads on the far right) does not have type 1 diabetes. He is a statistician and researcher, and has kindly joined as a voluntary member of ENDIA’s feedback group where study materials are sent intermittently to stakeholders for their input and feedback. There are 20 members in the group now. If you are interested in joining ENDIA’s Feedback Group, contact us at endia@adelaide.edu.au.